If you have worked with them, you know that sand and paving blocks complement each other in deeply gratifying ways. Loose sand is easy to work with as you grade a bedding layer for your new patio or walk. Yet when you compact sand, it firms up to hold pavers in place while you fine-tune their positioning. Sand is important for drainage, too: If you want your pavers to slope such that water will run off them, you create that slope, or pitch, by contouring the sand bed. And the sand itself, of course, lets moisture seep into the ground and replenish the water table. 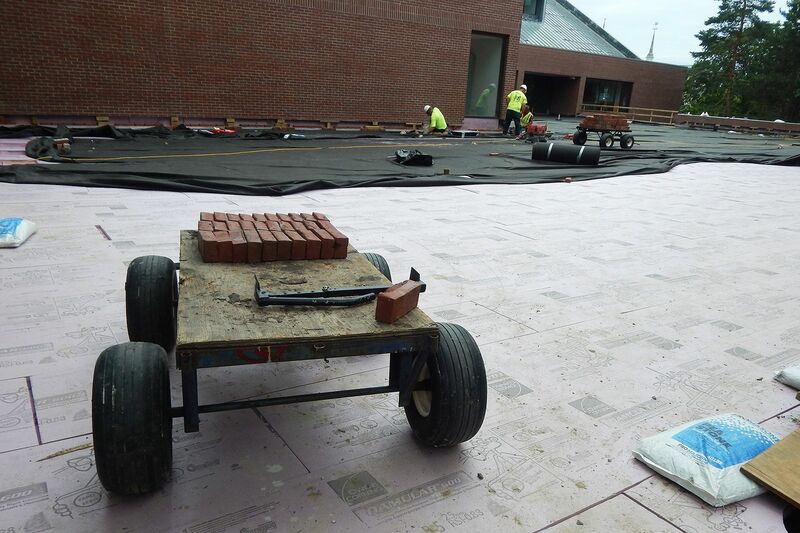 Such were our thoughts on Aug. 28 as we watched a Contracting Specialists Inc. crew spread sand and lay pavers on Ladd Plaza — a key phase in the summer-long reconstruction of the plaza. It was early afternoon, and we’d gotten there in time to see the crew rolling wheelbarrows over plywood runners laid atop the dunes to distribute the very last load of bedding sand for the project. There was a lot of sand around. The plaza was baking in bright sun and a temperature of 92. We couldn’t help but think of deserts and beaches (and the Drifters’ sound-alike followup to “Under the Boardwalk”). Only a few patches on the plaza still lacked their two-inch sandy layer. 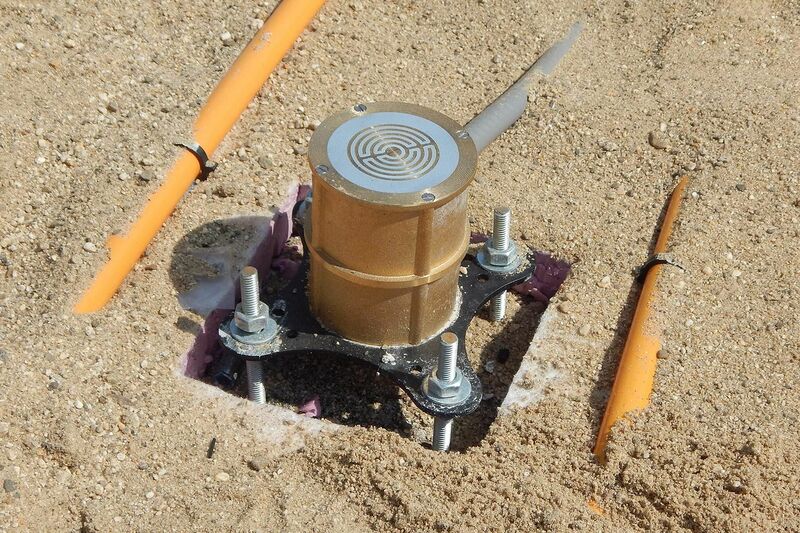 A foreman used electronic surveying gear, which signaled its progress with penetrating beeps, to check the elevation of the sand. 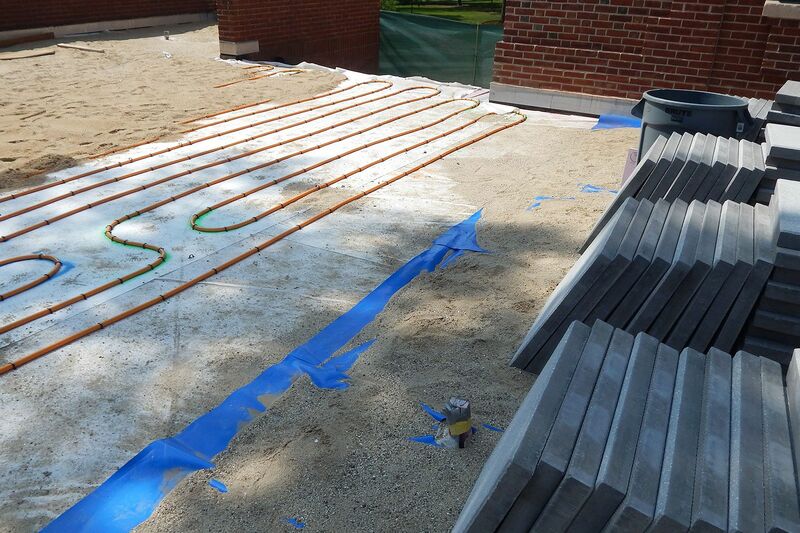 Lengths of shiny metal conduit marked off zones that needed grading, which the crew performed with screeds and boards. Meanwhile, along the edges of the plaza closest to Dana Chemistry, masons were placing pavers. Nearly two feet square, exactly two inches thick, and ordered in two colors for the Ladd project — limestone gray and charcoal — the concrete pavers were manufactured by Hanover Architectural Products of Hanover, Pa.
Project Manager Paul Farnsworth explained that project architect Gale Associates had designated one corner of Ladd Library as a starting point for paver-laying that would make it easiest to align the squares correctly as the pavement is spread across the site. “The concern we have about laying pavers, or tiles in general, is that by the time you’ve worked your way to the far wall you find out that wall isn’t perfectly square with the one you started from. So you end up with a bunch of odd-cut pavers,” Farnsworth said. Plastic spacers maintained the requisite gap between squares. A different variety of sand was used to fill the gaps: Alliance-brand Supersand Bond in slate gray, precisely calibrated and treated with polymers to create a durable joint. The 17,000 square feet of the plaza will be paved in a pattern called running bond, which comprises straight courses that are staggered relative to their mates on either side. 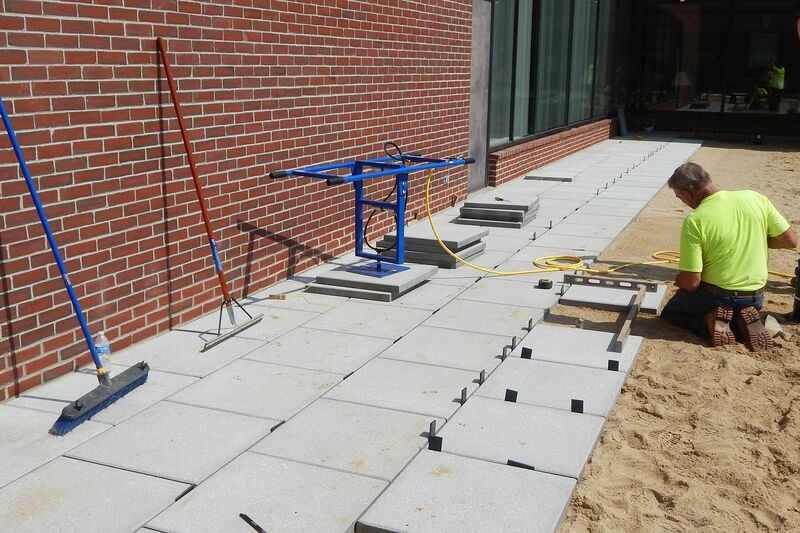 The charcoal squares will form “carpets” where planters and seating will be grouped. “It’s to break the scale so [the expanse] is not so monolithic,” Farnsworth explained. The masons were advancing across a wide front. One benefit (and one of the many obvious facts that become obvious only after they are pointed out to Campus Construction Update) is that the broader the front, the more masons you can fit in and the faster the work will go. 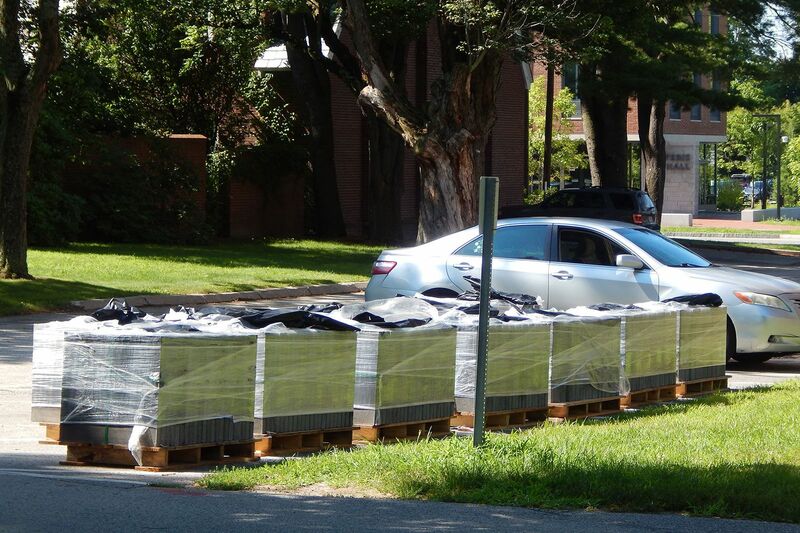 Even at that, it will take a few weeks to lay all the pavers. The few remaining unsandy patches displayed something interesting: 3/4-inch orange plastic tubing densely arrayed in graceful curves. 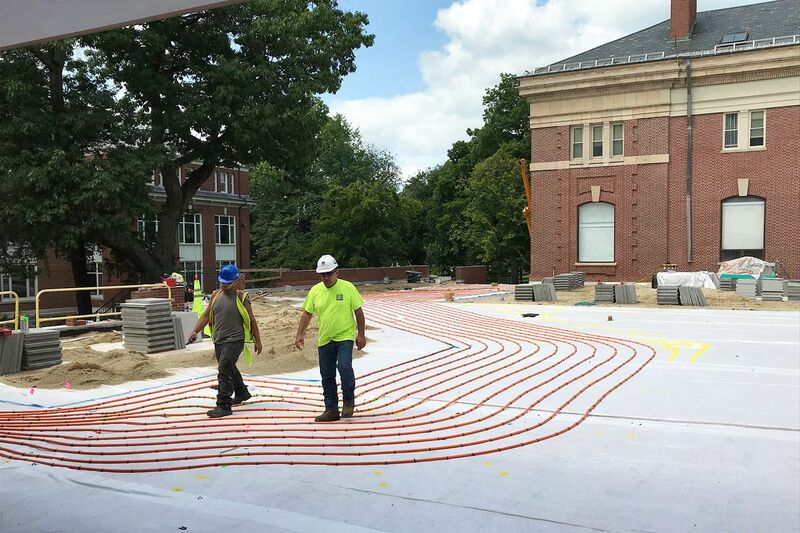 The tubing is part of a radiant snowmelting system that keep plaza walkways clear and reduce the workload for Facility Services crews after a storm. 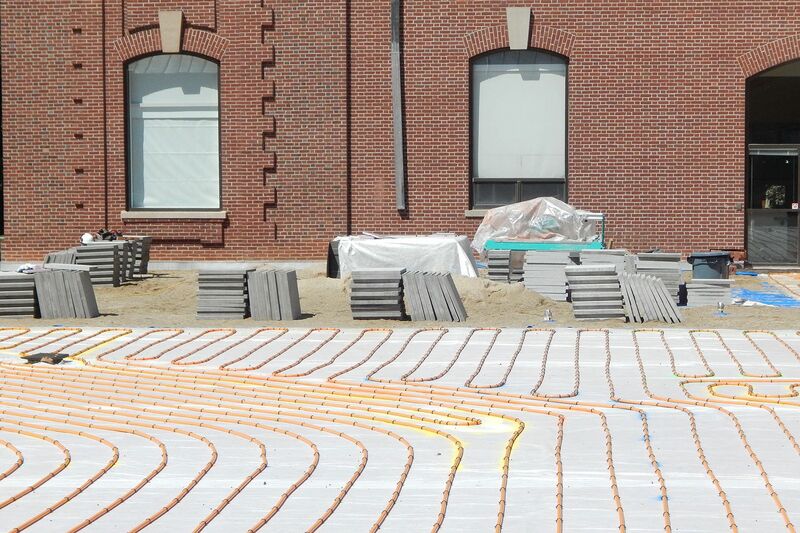 A heated antifreeze made of water and propylene glycol will circulate through the 9,200 feet of tubing to warm the plaza pavement, or least important walkways across it. A new heat exchanger in Ladd’s mechanical room will tap the campus steam supply to warm up the antifreeze. Two benches near the library entrance will conceal the connections between the exchanger and the tubing. And temperature-precipitation sensors embedded in the pavement will tell the system when to get busy. Two days after tubing installation began, a successful pressure test on Aug. 22 marked the completion of the system. After learning from Farnsworth that, in addition to its usefulness as a heat-transfer medium, propylene glycol is also a food additive — anyone for ice cream? — we turned to the Google for a quick briefing on the compound. It’s a source chemical, or feedstock, for the production of space-age polymers. It’s in the vapor that gives vaping its name. It’s a solvent. It’s a component in paint, eye drops, hand sanitizer and coffee-based drinks. It’s even the stuff that looks like smoke coming from the stack of your Consolidation-type Lionel toy steam locomotive. Steps action: Transfixed by concrete artistry at Coram Terrace and paver-sand interaction on Ladd Plaza, we’ve neglected to keep you abreast of developments around and between those Bates landmarks. 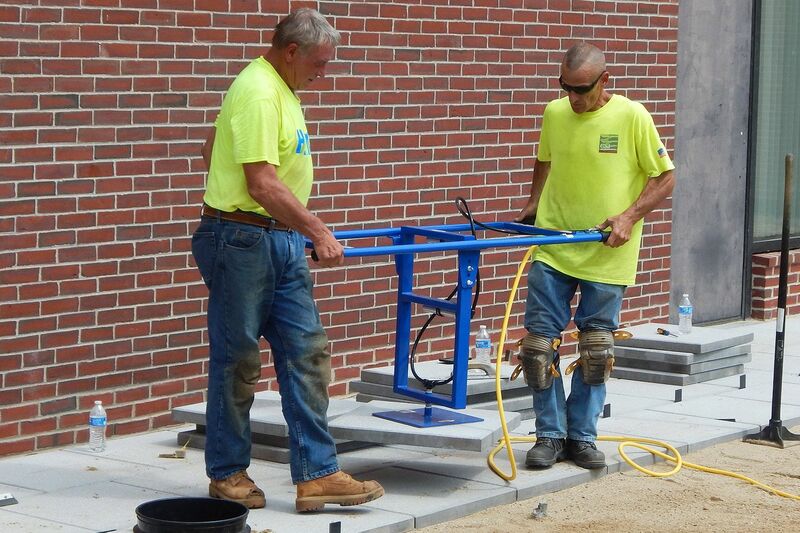 At the end of July, Sundown Construction of Auburn poured a set of concrete steps to replace one of the two asphalt ramps that flank Coram Library and connect the Historic Quad to Ladd Plaza. 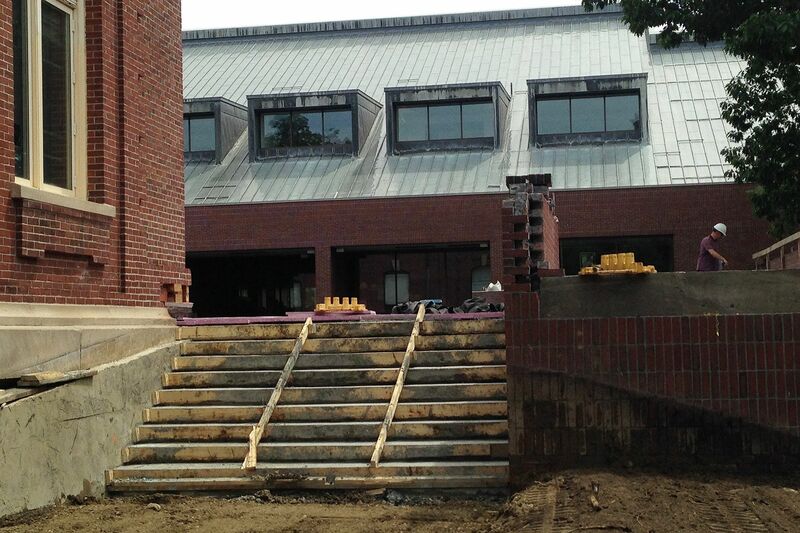 The still-unfinished steps, situated at the Carnegie Science end of Coram, are part of a new plan for plaza access. Where the ramp, a banking, and a rambunctious forsythia bush once dominated the junction of quad and plaza, there is now a sunny cleared space. Up the new steps and on the plaza at right, an alcove that was once blocked (or menaced), by the forsythia now affords a fine view west across the quad. A bench is bound for that spot. The matching ramp at the other end of Coram is currently a staging area and the main access for contractors renovating the plaza. But once that work is complete, the old walkway will give way to both a redesigned ramp for handicapped access and a stairway. Earlier in August, excavation for a new foundation at the site turned into something like archaeology. The dig revealed a mysterious old duct that, it was revealed, ran from a restroom ventilator in Coram’s basement into an exhaust vent embedded in the plaza’s parapet wall. Kind of a roundabout job, as Farnsworth noted. The underground portion of duct was removed, the ventilation rerouted, and the subterranean duct plugged with concrete. 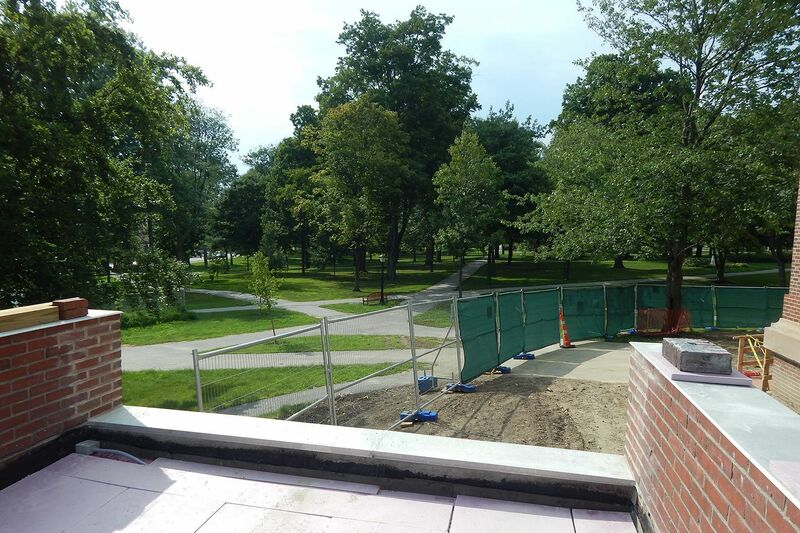 Around the plaza perimeter, bricklaying was the focus in late July and early August. 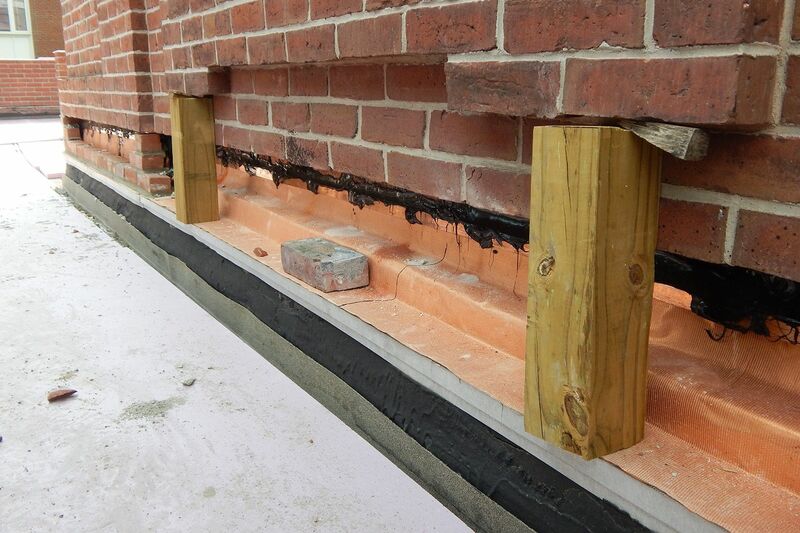 Masons have replaced virtually all the bottom courses extracted from the brick walls of the two libraries to make way for replacement of flashing and other waterproofing materials. They’re also nearly done rebuilding and reconfiguring the walls that enclose the terrace. Formerly capped with a row of bricks laid upright — a so-called soldier course — the parapet wall is now topped with a beveled course of precast capstone, underlaid with flashing to keep moisture out of the bricks. Can we talk? Campus Construction Update returns in mid-July. In the meantime, we welcome your questions and comments about campus improvements, as well as funny propylene glycol anecdotes. Please e-mail Doug Hubley, stating “Construction Update” or “Don’t make a fuss, dear — I’ll have your sand, I love it!“ in the subject line.